Mini Mission Monday – Happy Halloween! Just last week we talked a bit here about leveraging holidays as opportunities to reach out to people within your network. And here we are on a bona fide holiday! Ready to practice? Bring treats for your co-workers – candy (of course), or some other sweet. This is a day to ditch the diets and indulge a bit. Ask about weekend celebrations – parties, trick-or-treat events. People love to talk about their kids and this is a perfect opening. Send holiday greetings – wish them a frightfully good evening, ask how they are celebrating, share your own plans. Do you have any other ideas for leveraging the holiday to increase intimacy within your circle? The Greenlight Highlight is myGreenlight’s monthly community member spotlight interview. On the last Friday of every month, the Highlight features a community member who has reaped the benefits from building mutually rewarding relationships and captures the essence of relationship mastery. 30-Second Elevator Pitch: I am passionate about helping industries and companies take their marketing and communications beyond the promotional cycle to create messages that express passion and address what their customer really want and need. Favorite relationship mastery mindset and why? Generosity. Asking others how I can help them allows me to share my passion. That has been a powerful mindset shift for me. Helping others has opened many doors to other introductions. Since starting my business a year ago, I have not had to invest in marketing. Leading with generosity has brought word of mouth referrals that keep leading to new business opportunities. In my first year of business I made about $15,000. Since I’ve begun focusing on my relationship approach, my business has brought in $50,000 this year and 70% of the proposals I’ve submitted from referrals have landed me new accounts. When did it first click that relationships profoundly affect your success in business? I used to work for large multinational corporations like Shell, Quaker Oats. I worked hard, I achieved my goals and I was always well rated. Other people in the company were getting better jobs than I was being offered and I didn’t understand why. When I changed my work and started working as a marketing manager for a well-known Guatemalan real estate company, it clicked for me that internationally relationships are key to everything, relationships open doors. One day in 2006, I was in a Borders airport and I picked up Never Eat Alone. That was the piece that changed my entire outlook.… What I do today doesn’t feel like work. I’m helping others and giving value with what I do best. How has putting a thoughtful process around relationship development benefited your business? Non-verbal communication is as powerful a tool as language itself, whether it comes to creating immediate rapport, maximizing your influence or reading other people to discover their true intentions. That’s what Joe Navarro learned how to do during his 25 years in the FBI interrogating suspected criminals, spies and terrorists. As one of the original founding members of the FBI’s Behavioral Analysis Program, Navarro mastered his ability to read non-verbal body language. When he retired in 2003, he discovered his expertise and skills could be taught and benefit everyone from professional poker players to executives who wanted an extra edge. Since then, he has authored numerous books including the now-classic, What Everybody Is Saying. Does Your Success Require a College Education? My parents, both of whom earned master’s degrees and were front and center in my school’s PTA, taught me that some of the best learning opportunities are outside the classroom – for example, when they let me skip class to visit a local criminal trial in 8th grade. Though I loved school, I was still anxious to finish college early and find ways to learn that I would not only be paid for, but that would have some use beyond my GPA. Some of the brightest, most successful people I know today are autodidacts, high school and college dropouts. And in my work with myGreenlight, I’m part of a rapidly evolving world of online learning options that lets individuals close self-identified skills gaps affordably and on-demand. All this is to say that I’ve been thrilled and excited by recent public debate around the value (and cost) of higher education. The conversation has been fueled by economists (e.g. Richard K. Vedder of Ohio University and Robert I. Lerman of American University); by venture capitalists and entrepreneurs (Peter Thiel and Seth Godin); by online educators (startups like Udemy and sprawling organizations like the University of Phoenix) and by writers — most recently, Michael Ellsberg, whose new book The Education of Millionaires (recently discussed in his myG Social Capitalist interview and you can get a free first chapter at his site) seeks to teach vital success skills in sales, networking, and self-marketing that are neglected by university degree programs. This week, Michael’s book provoked a tart review in Time, which Michael then rebutted in The New York Times. This is Your Brain on Facebook. Any Questions? Could that be an indication our online relationships cause different reactions in our brains than the real world ones? What do you think? Do you treat online friendships differently? The holiday season is approaching, and while sending greetings during the “busy season” is surely appropriate and appreciated, it is hard to stand out from the crowd at a time when airwaves and mailboxes are packed full. One of Keith Ferrazzi’s special tactics is to send Thanksgiving greetings, to thank contacts for their impact on his life and business, as well as to reach out during a less busy time. Check out this list of obscure holidays and see if there are some that align well with your contacts. You could stand out by being the only person to ask a colleague to join you for lunch on Sandwich Day (Nov 3), or treating the office on National Chocolate Covered Anything Day (Dec 16). At the very least, you can have a fun debate over whether it is actually necessary to have an entire National Soup Month (January). Also consider: for Groundhog Day – use the holiday to get people to think about what their next quarter will bring – and how to make it a great one. Or even for Valentine’s Day – take advantage of the date to tell people how much they matter (no roses required). This week in the Relationship Roundup, examples from brands that are getting social and tips for getting more personal with your brand. As the sales leader of a company that empowers both organizations and professionals to enhance their relational capital, my jaw dropped recently when I read the title of very interesting HBR Blog post: Selling Is Not About Relationships. Judging by how quickly the blog approached 200 comments, authors Matthew Dixon and Brent Adamson clearly struck not just my nerve by challenging the role of relationship-building in successful selling. However, upon review of the article we are a lot closer to agreement than the provocative headline would ever suggest. Each week I speak with a handful of Sales VPs, as well as multiple C-Level executives across the Fortune 500. A common denominator of those discussions is the importance of establishing meaningful connections both within an organization itself, and of course externally with influential professionals across an entire value chain – clients, prospects, suppliers. Whether analyzing a new-hire’s speed to efficacy during the onboarding process, long-term employee retention, or the quantifiable impact on a sales person’s job performance, one’s ability to establish meaningful relationships translates into success. So what to make of this study? Having examined 100 companies and 6,000 reps, Dixon and Adamson conclude that every sales professional falls into one of five distinct profiles and is characterized by a specific set of skills and behaviors that highlights the rep’s primary mode of interacting with customers. Those falling into the Challenger category dominated the list of high performers while Relationship Builders came in last. 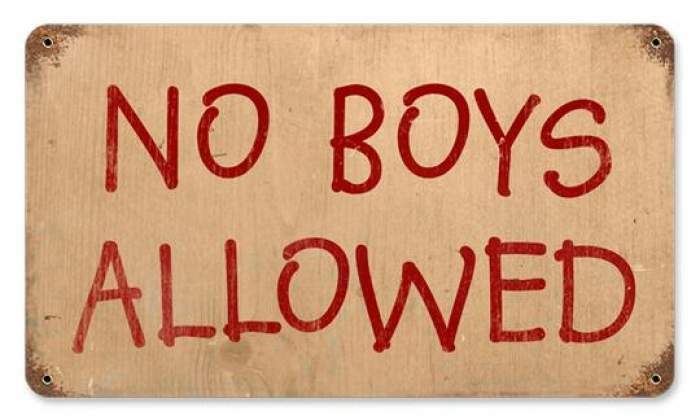 Is There Value to “‘No Boys Allowed” Networking? We have all heard the phrase “old boys’ network” and many of us have seen it in action. While the workforce has changed much over the past decades, this preconceived networking bias still impacts many professional women.